A large pub in South Hackney, overlooking Victoria Park. There's quite a large main room which curves around the bar, as well as a separate dining area, which on a Sunday afternoon visit was dominated by parents with their children (much like the other pubs in this very gentrified area of Hackney). There's an upstairs function room as well, which a large sign on the front of the pub advertises. 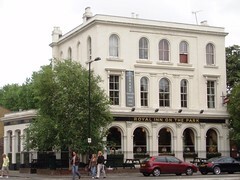 In July 2008, the real ales on handpump were Fuller's London Pride, HSB, Discovery as well as King Alfred Bitter. Honey Dew, Litovel, Hoegaarden, Leffe and a couple of other interesting lagers were on draught. Food is served 12:30pm-3:30pm and 6:30pm-10pm Tuesday to Saturday, and 12:30pm-4pm Sunday. Ewan had butternut squash arancini with a green bean salad (£8.50), which were very tasty and attractively presented photo. The beans were fairly al dente, and the salad worked very nicely alongside the substantial balls of risotto rice. Last visited by Ewan, 6 July 2008. Opening hours and food times taken from Time Out website, July 2008. Last edited 2016-08-30 17:45:33 (version 9; diff). List all versions. Page last edited 2016-08-30 17:45:33 (version 9).